In continued research, a test of this Po radiohalos formation model in metamorphic rocks was proposed. Sandstones often contain some zircon grains, derived from erosion of, for example, granitic rocks and deposited in water-transported sandy sediments. Chemical weathering of such source rocks plus abrasion of grains during water transport destroys all biotite grains, so none are ever present in sandstones. However, when sandstones are metamorphosed, the resultant schists and gneisses usually contain biotite grains, which could thus have only formed via mineral reactions during the metamorphism. Such mineral reactions have been studied in laboratory experiments and in them water is often a by-product.11 At the temperatures of these metamorphic processes such water would become hydrothermal fluids capable of transporting any U-decay products from nearby zircon grains and depositing Po in biotite flakes to form Po radiohalos. The thick Thunderhead Sandstone (Upper Precambrian Great Smoky Group) in the Great Smoky Mountains along the Tennessee/North Carolina border was deformed and regionally metamorphosed during formation of the Appalachian Highlands, beginning in the so-called Devonian (that is, early in the Flood year).12-14 With increasing temperatures and pressures from northwest to southeast, the regional metamorphism produced in these sandstone layers a series of chemically and mineralogically distinct zones of schists and gneisses.15 These zones are named according to the first appearance of the distinctive metamorphic minerals which characterize them as the intensity of the metamorphism increased laterally—the biotite, garnet, staurolite, and kyanite zones. The boundaries between these zones, called isograds, are where mineral reactions have produced the new minerals because of the progressively higher temperatures and pressures. When originally deposited, the Thunderhead Sandstone contained occasional zircon grains, but no biotite flakes. This metamorphosed sandstone, however, now contains both biotite flakes and zircon grains throughout all these metamorphic zones. Because they still contain minor amounts of U, the zircons would thus have been a source of 238U decay products including Po. Therefore, if hydrothermal fluids had been generated by the metamorphism, according to the hydrothermal fluid transport model for Po radiohalo formation, those hydrothermal fluids should have transported the Po diffusing out of the zircons into the biotite flakes, where it should have formed Po radiohalos. 54 muscovite + 31 chlorite —> 54 biotite + 24 staurolite +152 quartz + 224 water which has been confirmed experimentally.16-17 The generation of this water by this reaction at the prevailing high temperatures determined experimentally would thus have resulted in relatively large volumes of hydrothermal fluids in the rocks surrounding this isograd. These would have been ideal conditions for the generation of Po radiohalos in these metamorphosed sandstones, if Po radiohalo formation does indeed occur as described by the hydrothermal fluid transport model. 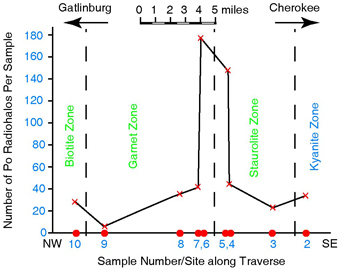 Therefore, as a test of the hydrothermal fluid transport model for Po radiohalo formation, nine samples of the metamorphosed Thunderhead Sandstone were collected from road-cut outcrops along U.S. Highway 441 between Cherokee, North Carolina, and Gatlinburg, Tennessee, forming a traverse through the biotite, garnet, staurolite, and kyanite zones of the regional metamorphism as already described.18 The biotite flakes were separated from these samples and scanned under a microscope for radiohalos, using standardized techniques.19-20 The total number of Po radiohalos found in each sample was then plotted against each sample's relative position along the traverse through the metamorphic zones (figure 1). Figure 1. Po radiohalos for the samples along the traverse through the regional metamorphic zones across the Great Smoky Mountains, Tennessee. The results of this test were astounding. As can be readily seen in figure 1, whereas seven of the samples averaged around 30 Po radiohalos each, the two samples straddling the staurolite isograd contained 177 and 147 Po radiohalos respectively. This is exactly as predicted. Uranium-bearing zircon grains and biotite flakes are present in the metamorphosed sandstones in all samples along the traverse, so during the metamorphism the minor water originally in the sandstones when deposited has generated some Po radiohalos. However, where the mineral reaction around the staurolite isograd has produced a lot of hot water, large numbers of Po radiohalos have formed. The hydrothermal fluid transport model for Po radiohalos formation has thus been tested and verified. Neither the Po nor the biotite flakes were primordial. The biotite flakes were formed in the sandstone only during the metamorphism early in the Flood year, and the Po was derived from 238U decay in the zircon grains. And where extra water was generated during the metamorphic processes, many more Po radiohalos were formed. This successful verification only serves to spur on continuing research, because the time scale implications for the formation of the Po radiohalos and these metamorphic rocks are only consistent with a global Flood on a young earth. Snelling, A. A., "Radiohalos," in L. Vardiman, A. A. Snelling, and E. F. Chaffin, eds., Radioisotopes and the Age of the Earth: A Young-Earth Creationist Research Initiative (2000, El Cajon, CA., Institute for Creation Research, and St. Joseph, MO., Creation Research Society), pp. 381-468. Snelling, A. A., "Radiohalos in Granites: Evidence for Accelerated Nuclear Decay," in L. Vardiman, A. A. Snelling, and E. F. Chaffin, eds., Radioisotopes and the Age of the Earth: Results of a Young-Earth Creationist Research Initiative (2005, El Cajon, CA., Institute for Creation Research, and St. Joseph, MO., Creation Research Society), pp. 101-207. Snelling, A. A., and M. H. Armitage, "Radiohalos—A Tale of Three Granitic Plutons," in R. L. Ivey, Jr., ed., Proceedings of the Fifth International Conference on Creationism (2003, Pittsburgh, PA., Creation Science Fellowship), pp. 243-267. Snelling, A. A., J. R. Baumgardner, and L. Vardiman, "Abundant Po Radiohalos in Phanerozoic Granites and Timescale Implications for Their Formation," EOS, Transactions of the American Geophysical Union, 84:46, Fall Meeting Supplement (2003), Abstract V32C-1046. Snelling, A. A. (2005), op. cit. Stanton, R. L., "An Alternative to the Barrovian Interpretation? Evidence from Stratiform Ores," Proceedings of the Australasian Institute of Mining and Metallurgy, 282 (1982): pp. 11-32. Stanton, R. L., "The Precursor Principle and the Possible Significance of Stratiform Ores and Related Chemical Sediments in the Elucidation of Processes of Regional Metamorphic Mineral Formation," Philosophical Transactions of the Royal Society of London, A328(1989): pp. 529-646. Snelling, A. A., "Towards a Creationist Explanation of Regional Metamorphism," Creation Ex Nihilo Technical Journal, 8 (1994): pp. 51-77. Spear, F. S., Metamorphic Phase Equilibria and Pressure-Temperature-Time Paths (1993, Washington, D.C., Mineralogical Society of America). King, P. B., J. B. Hadley, R. B. Neuman, and W. B. Hamilton, "Stratigraphy of the Ocoee Series, Great Smoky Mountains, Tennessee and North Carolina," Geological Society of America Bulletin, 69 (1958): pp. 947-956. Hadley, J. B., and R. Goldsmith, Geology of the Eastern Great Smoky Mountains, North Carolina—Tennessee (1963, Washington, DC, U.S. Geological Survey Professional Paper 349-B), 118 pp. King, P. B., Geology of the Central Great Smoky Mountains, Tennessee (1964, Washington, D.C., U.S. Geological Survey Professional Paper 349-C), 148 pp. Allen, G. C., and P. C. Ragland, "Chemical and Mineralogical Variations during Prograde Metamorphism, Great Smoky Mountains, North Carolina and Tennessee," Geological Society of America Bulletin, 83(1972): pp. 1285-1298. Hoschek, G., "Untersuchungen zum Stabilitätsbereich von Chloritoid und Staurolith," Contributions to Mineralogy and Petrology, 14(1967): pp. 123-162. Hoschek, G., "The Stability of Staurolite and Chloritoid and their Significance in Metamorphism of Pelitic Rocks," Contributions to Mineralogy and Petrology, 22 (1969): pp. 208-232. Allen, G. C., and P. C. Ragland (1972), op. cit. Snelling, A. A., and M. H. Armitage (2003), op. cit. * At time of publication, Andrew A. Snelling, Ph.D. geology, was an associate professor in the Geology Department at the ICR Graduate School. Cite this article: Snelling, A. A. 2005. Polonium Radiohalos: The Model for Their Formation Tested and Verified. Acts & Facts. 34 (8). Doesn't Radioisotope Dating Prove Rocks Are Millions of.,.